This week has gone by so quickly. I have really enjoyed sharing a bit of my quiltmaker's life, but it is hard to wrap all 42 years of it up in one week! Many thanks to Chris Webb who started this project, I am looking forward to seeing who pops up during the next 32 weeks! My inspiration through all this has been my family who have always been so supportive and interested. My husband is quite happy to go into fabric and quilt stores with me (I know I am very lucky), I appreciate his advice and his fabric choices! My kids and grandchildren all love to have my quilts and wallhangings, they love to hear the stories behind them the young ones love to get into my sewingroom to help pick out fabrics. 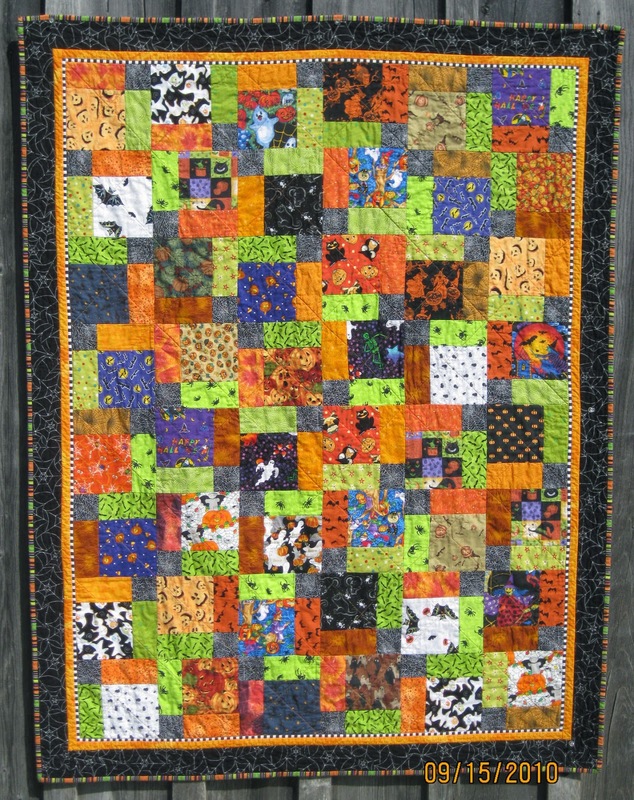 I am hoping one or more will make their own quilts someday. 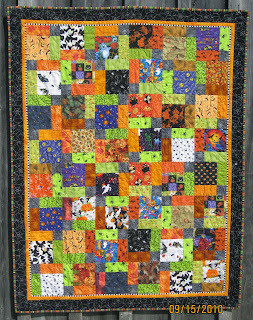 Ben's Hallowe'en Surprises My very first quilt teacher, Polly Greene, has always been an inspiration. Her straightforward way of teaching and her wonderful use of fabrics will always be with me. She will be 86 this summer and has another workshop to teach for our Guild in June. She has a wonderful sense and use of colour. Two years ago Valerie Hearder, Laurie Swim and I curated a retropsective of her quilts which was held at the Mary E. Black Gallery in Halifax. Polly, on the left talking to Valerie Hearder at the opening. It was so wonderful to see so many of her quilts in one place. My other inspiration was my maternal Grandmother, she died when I was 16 and she was 88. I don't have a memory of her quilting but I do remember her always knitting, crocheting, weaving, sewing, her hands were always busy even though she suffered from arthritis. I remember those hands so well.I treasure the quilts I have that she made as well as many linens that she embroidered...she gave me a gift of patience something we all need as quiltmakers. Over the years I have had many teachers, have taken many workshops and I still do. 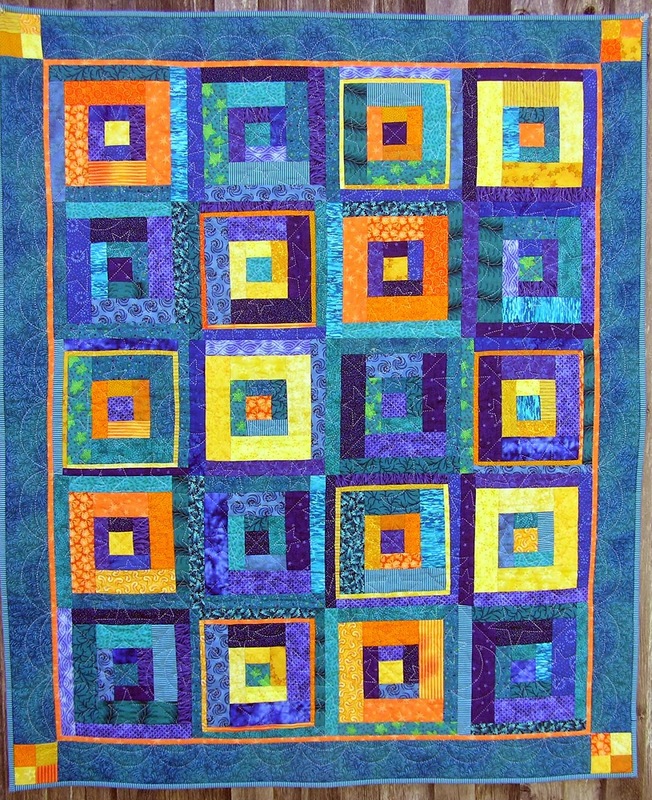 I am inspired by those teachers and by my fellow quilters who take the workshops, there is always something to learn. I have been involved with three Guilds and have watched them grow from a very few to over 100 members. My own local Guild, the Mahone Bay Quilters Guild now has over 125 members. Our provincial Guild is celebrating their 15th bi-annaul Quilters Retreat this coming September, we started in 1987 long before "retreats" became so popular. We are still going strong with 3 teachers (Karen Kay Buckley, Ana Buzzalino and laurie Swim) all full workshops. I am sure it is going to go on for more years to come. Waiting The quilt we presented to Picotu Lodge as a thank you for having us for all these years. I could go on and on about what has inspired me over the years, I am looking forward to many more inspirations to come! I do have a bit of advice! When I went to my first quilt conference, the Continental Quilt Congress in Washington, DC I went to a lecture by Elly Sienkiewicz and she told us to buy the best tools we could, not to buy the cheap ones. I took her advice and spent what seemed like a small fortune on a pair of Gingher scissors, I still use them everytime I cut out a quilt! I know it is expensive to go out and buy a good rotary cutter, a good mat and a good ruler but it is worth it! I would also encourage beginners to start small, don't start out and try to make a king sized quilt! Start small and finish it, make wallhangings, pillow covers, placemats, there are lots of smaller projects to get you going and by finishing them you will be encouraged to go on. Like most quilters I have UFO's as well as a list of future projects in my head! I always have something I am handquilting, something to applique, something to piece. At the moment I have 7 or 8 projects in various stages, so if I am in the mood to quilt I can easily pick up where I left off. 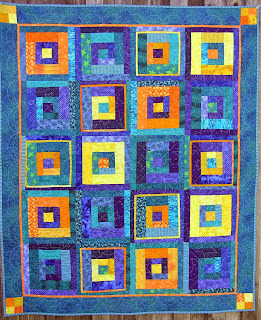 My last bit of advice would be to join a Quilt Guild and please volunteer at a Guild, you will make some wonderful friends of all ages, you will learn something and you will find like minded quilters who are passionate about what they make. And if you are ever in Mahone Bay, Nova Scotia on the first Monday of the month (except July and August) we love to have visitors! Check our blog for details!